My main interest is in the improvement in outcomes for men with prostate cancer. This boils down to earlier diagnosis, more effective treatment, better supportive care and reduction in treatment related side effects. This interest is underpinned by interests in running multi-centre clinical trials, improvements in radiation treatment delivery, radiation injuries to normal healthy tissues and its treatment, factors influencing the psychological well-being of the patient, and the role his partner, daughters or other carers play in his diagnosis and on-going well-being. Although my parents, brother and cousin laid no expectations on me, it is clear that I followed the examples they set for me. All of them were involved in one form of research or another. It was my wife, Liz’s outstanding support, however, that enabled me to follow this pathway. Every clinical researcher wants to participate in the development of new treatments or new treatment approaches that will achieve meaningful benefits for patients both here in Australia and elsewhere in the world. I am no different. Conjoint Professor Jim Denham OAM is a Senior Staff Specialist in the Department of Radiation Oncology at the Calvary Mater Hospital in Newcastle and a Conjoint Professor of Radiation Oncology at the University of Newcastle. His research is in the field of clinical oncology where we works to optimise the use of radiation to limit damage to healthy tissue and improve outcomes in cancer patients, in particular prostate cancer patients. Since completing his medical training at the Middlesex Hospital and Mount Vernon Hospital in the United Kingdom in 1983, Professor Denham has made significant advancements in the field of radiation oncology. His initial research looking at the development of Follicular Non-Hodgkin’s Lymphomas led him to be interested in how radiation was treating cancer and how it could be better administered. Professor Denham soon moved to Australia and began a career at the Royal Adelaide Hospital researching how chemo-radiation was used to treat preoperative and definitive oesophagael cancer. In 1987, he took up a position as Senior Staff Specialist and Director of the Radiation Oncology Department at the Calvary Mater Hospital in Newcastle. 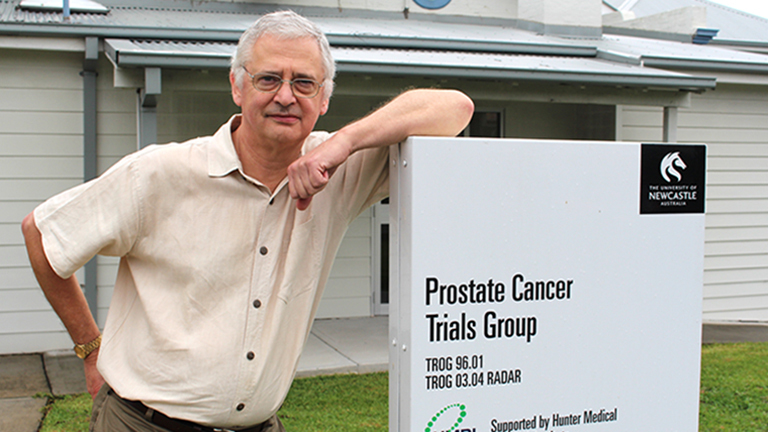 Here, Professor Denham has been central in establishing one of Australia’s largest clinical trials groups, the Trans-Tasman Radiation Oncology Group (TROG) which has conducted over 21 phase II clinical trials and over 26 phase III clinical trials, totaling over 12,000 patients from 28 Australian and New Zealand cancer centres. In this role, Professor Denham has been actively involved in two major prostate cancer clinical trials which has seen more than 48 peer-reviewed scientific publications regarding the cancer related outcomes in relation to treatment regimens. Professor Denham is also interested in how radiation can affect normal tissue in cancer patients and has had an active research career in this field. In 2006, he was involved in a community awareness program that successfully lifted the Hunter’s prostate cancer detection rate from the lowest in NSW to the highest which highlights Professor Denham’s outstanding contribution to the community. Professor Denham has published more than 190 publications and presentations and has gained more than $10 million in research funding. In recognition of his excellent research career, HMRI awarded Professor Denham with a Sparke-Helmore Award for Research Excellence in 2006 and in 2013 he was awarded a NSW Government Community Service Award. He was also was honoured with a Medal of the Order of Australia (OAM) for his contribution to medicine and dedication to improving treatments for men with prostate cancer. Many novel findings have already emerged from Professor Denham’s major research focuses including a major clinical trial for men with locally advanced (i.e. dangerous) prostate cancer (called the RADAR trial). This trial has the potential to demonstrate major reductions in the spread of prostate cancer from the use of novel treatment programs that cause less treatment related side effects than current widely used treatments across the world.